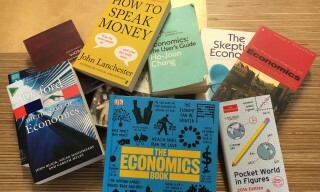 New books on economics hit the stores every day. But with so many being published, what if you don't have time to read them, don't want to or can't? Well, try heading over to YouTube, where, by searching for the title and/or author, you can watch interviews and talks from writers that distil the essence of a huge range of books, new and old, in a matter of minutes. Here are just a few of my favorites you might want to check out. Capital in the Twenty-First Century by Thomas Piketty was a smash hit bestseller in 2014. Everyone was talking about it, but how many of us could really fit this mammoth 700-pager into their busy lives? Well, now you can get the basics in just 1 hour 26 minutes! Want the experience of working at Google but without having to learn all that code? YouTube features videos of talks held in Google offices all over the world. At the time of writing, more than 2600 are available, including this one by Ha-Joon Chang, the author of Economics: The User's Guide. Tip: If you watch more than one talk from one author but it’s getting a bit repetitive, try skipping to the Q&A section. You’ll see how the author handles questions you may not have thought of and get all sorts of useful related information. LSE Public Lectures are regular events held by the London School of Economics and Political Science. It features new videos every week, with loads of well-known economists and authors explaining just what their books are about. The RSA’s YouTube channel is another great resource. The most impressive feature is their hand-drawn animations, each just a few minutes long. They’re visually attractive and more compact than regular talks. TED Talks by authors usually go beyond the topics of one particular book, but you can find some great videos, such as the one by behavioural economist Dan Ariely. Tip: TED Talks are great for two things. Firstly: a highly condensed framework of the author’s works. Secondly: key quotes (when an author has a good quote, they’ll usually keep saying it!). If you’re lucky enough, a TED talk can bring you the essence of someone's work within 18 minutes! I was once invited by a friend to be a guest speaker at a launch event of his book about the recent works of David Harvey. As a finance major who never studied Harvey before, it would be a formidable task cramming dozens of Harvey’s books before being able to talk. Fortunately, there’s YouTube. In the talk above the distinguished professor outlines the thesis of his 2014 book Seventeen Contradictions and the End of Capitalism. Are there any great economics talks you've found on YouTube? Let us know so we can feature your selections on Economy in the coming months.